After a wildly successful Kickstarter, Privateer Press and Whitemoon Dreams have brought Warmachine: Tactics to fruition and are currently cranking out solid revisions on a regular basis. The game is available now on Steam as an Early Access title and I’ve been playing it for a while now and I’m here to tell you all about it. We’re going to talk about all the aspects of the game, including the Early Access bits and where the game is headed. If you’ve been wondering about the game for a while, now’s your chance to tune in find out what it’s is all about! This is what matters most so I’m going to tackle the topic first. Gameplay, overall, in Warmachine Tactics is a blast. It’s not without its minor flaws, but getting to get into the nitty gritty of each unit and doing cool things like combined attacks, casting spells with your warcaster, or slamming your opponent to the ground with a warjack are sheer joy. The ever-evolving gameplay and unit additions with each patch just make the game more and more fun each time you fire it up. Personally I’m not a person who gets to play much Warmachine on the tabletop due to the extremely limited player base in my area – the only other person I know who plays is…my wife. So being able to experience Warmachine while I’m hunkered down in front of my PC or laptop has just been super awesome. 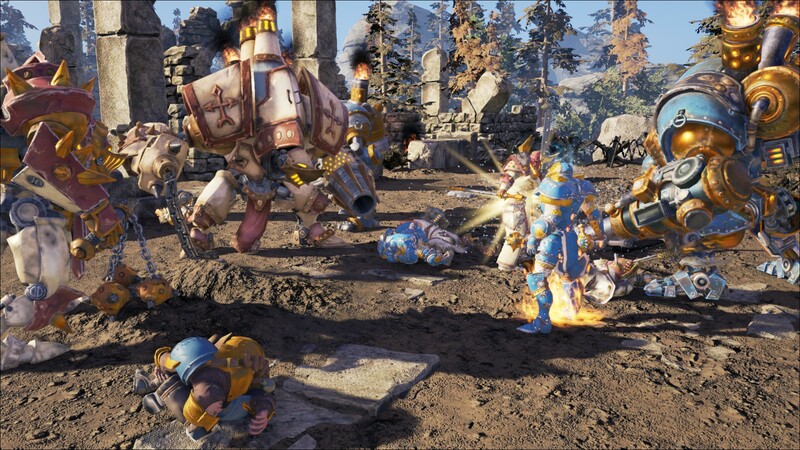 The gameplay really feels kinetic, for a tabletop simulation you’d think the models would feel a little static but damn, when your warjack connects with an opponent – you really get a good impression of the heft and weight these guys carry into battle. The spells from the warcasters are full of glitz and effects, and the units overall are cohesive and fun to play and strategize with. A downside to the gameplay thus far has been the AI. While I’m sure AI is a priority they plan on working on once more of the units and base gameplay elements are more refined, as it stands now, the single player map in the game just really involves enemy units kind of running at you waiting to be decimated. Sometimes they attack, sometimes they don’t, it’s a toss up. If you want to check out a full hour of gameplay going through this first single player map (from an earlier build, the UI and a few other elements aren’t as refined as they are now) be sure to check out the video below. A recent update has also brought in a army loadout editor so you can customize who you take into battle, an essential bit for any wargame. The only real downsides that I see to gameplay are simply ones that are making some of the wargaming crowd upset in that it doesn’t 100% replicate the tabletop game, such as Warjacks not having systems due to “technical limitations”. I’d like to hear more from Whitemoon as to what exactly those limitations are because it seems like a big chunk of some of the appeal to Warmachine as a whole – shutting someone’s warjack down by disabling the arm that operates their nastiest weapon, are missing. Units functions like solos, and some of the warjack mechanics (throws) aren’t in the game yet but will be patched in later. First thing’s first, this game is gorgeous. 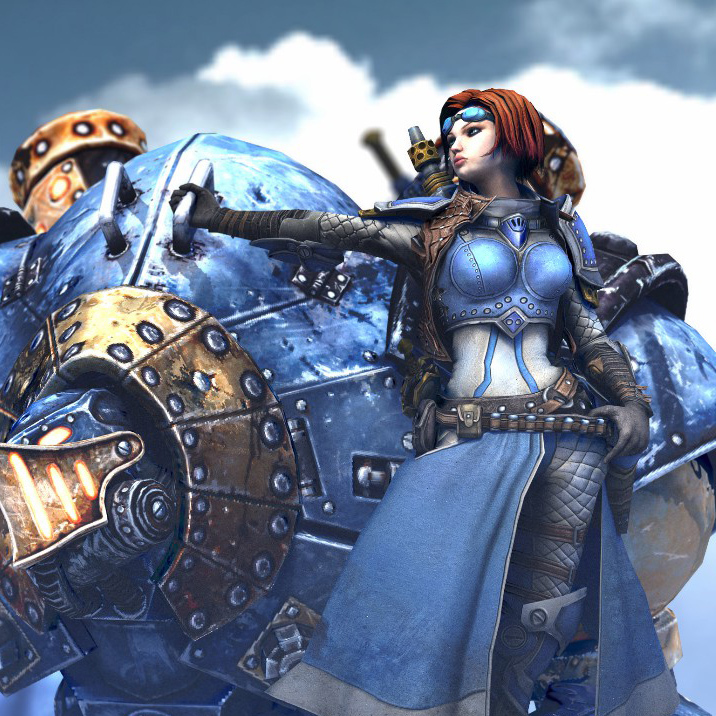 Seeing all of the Warmachine goodness brought to life in the Unreal engine is awesome. The textures can leave a bit to be desired if you zoom in extremely close, (I am playing with full graphical bells and whistles, sans motion blur – because, motion blur) but then again these model textures may only be placeholders to be further improved upon. 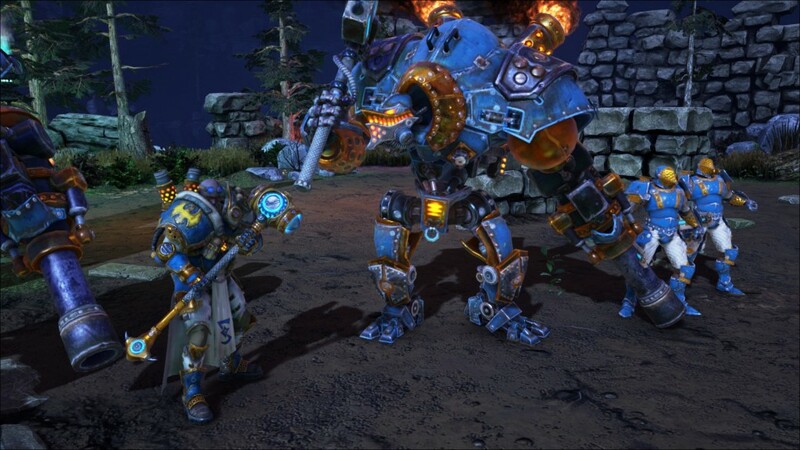 Either way, no one is going to play WMTactics zoomed in on the rivets on a Warjack, let’s be realistic here. Beyond that, this area is really where my biggest gripes with the game come into play. Luckily, these are the ones that matter the least. The UI has really evolved over the course of the game so far, at first it was almost unbearable for me, but with recent updates it has gotten a lot better (see gallery below). I still think that the UI itself could use some paring down, it takes up a lot of screen real estate and comes of as being quite clunky in some cases. At the very least, they could make some of the panels retractable/hideable (minimap, combat log, etc.) 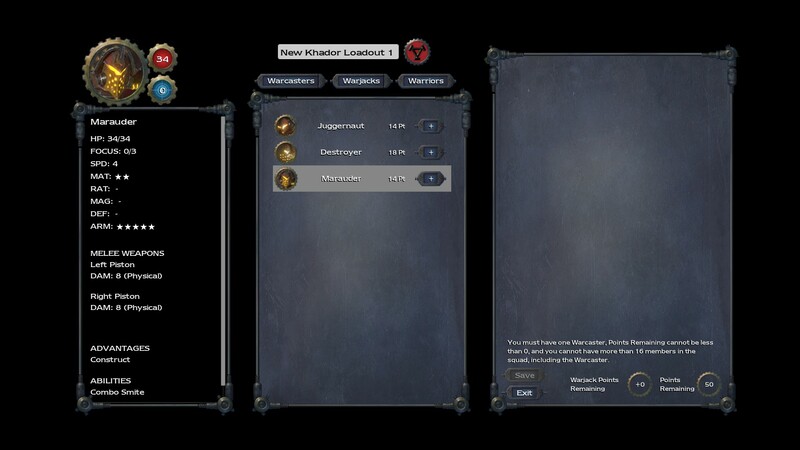 and have some smaller unit icons and/or better placement on the HUD. Some of the newer UI elements are a lot better looking but the coloration throws me off, though many years of gaming and using computers, when I see an option that appears to be “grayed out” among other brightly colored menu options I just assume by default that it is not available to me. So things like what you see in the example here throw me off at first. Can I use combined attacks here? Yes, but it sure as heck doesn’t look like it! Another issue that I have with the graphical aspects of the game are that the only display options are windowed or fullscreen windowed, but no true “fullscreen”. True fullscreen being that if you have a second monitor like I do, the game would constrain your mouse cursor to the screen area and not let it travel outside and onto the other monitor. The gamma needs some tweaking right off the bat and there is some texture pop in that is common with the Unreal Engine. Overall I know these are nitpicky things to call out, I’m sure the devs will tighten things up as they move along. I’d rather them focus on the gameplay first over aesthetics, it’s just that my focus on how usable the UI is gets the best of me here. There are several control options for Tactics, you can play the entire game almost entirely mouse driven if you’d like but you’ll still want to adjust the camera at times. There are tons of hotkeys for unit and ability selection, as well as nice bits to hide the UI or show the grid if that’s what you’re into. My main gripe here is that sometimes the camera controls really fight with some aspects of unit traversal, especially with facing. You must have the camera spun around in such a way that when choosing unit facing you’ll need to be able to see the angle you’re trying to go. It’s a little hard to explain without a visual but the controls overall could use a little tightening up. Sometimes the controls just feel like they don’t “stick”, I wouldn’t say “unresponsive” though, just quirky at times. I’m sure all of these control elements are nothing they won’t nail down though, as mentioned previously, each patch makes the game better and better. What I’d really love to see would be in-game support for controllers, because the game would fit perfectly into a relaxing evening of running skirmishes with your buddies while sitting on the couch and putting Steam’s Big Picture mode to good use. Warmachine Tactics is one of those games that got a lot of attention right out of the gate, for a mix of reasons really, most of them good. A tabletop wargame coming to PC in an as-true-to-form-as-possible for the medium, a Kickstarter come true, seeing the Iron Kingdoms come to life in full 3D complete with slick animations and sound effects, and another Early Access title for junkies like me to dive into and poke around at. Unfortunately another of the reasons the game got a lot of attention was it’s price tag. “Bad” reviews from folks who paid $60 for the early beta access when it showed up on Steam, I’m not sure what they were expecting…a finished game? I’m not certain but, no one is holding a gun to anyone’s head when it comes to purchasing Early Access games. You’re taking a risk, like you would with any other title that’s in early access. Only in this case, you have folks with a reputation to protect standing behind it. So let’s get one thing straight before we return to discussing the game, one that many of you have been asking me since I started playing, streaming, and tweeting about it. Is it worth $60? The answer is yes and no. As it is right now is the game worth $60? Absolutely not, but the whole idea of that price tag is to enter on the ground floor and to help make the game better, you are getting the “Digital Deluxe Edition” and the exclusives that come with it. 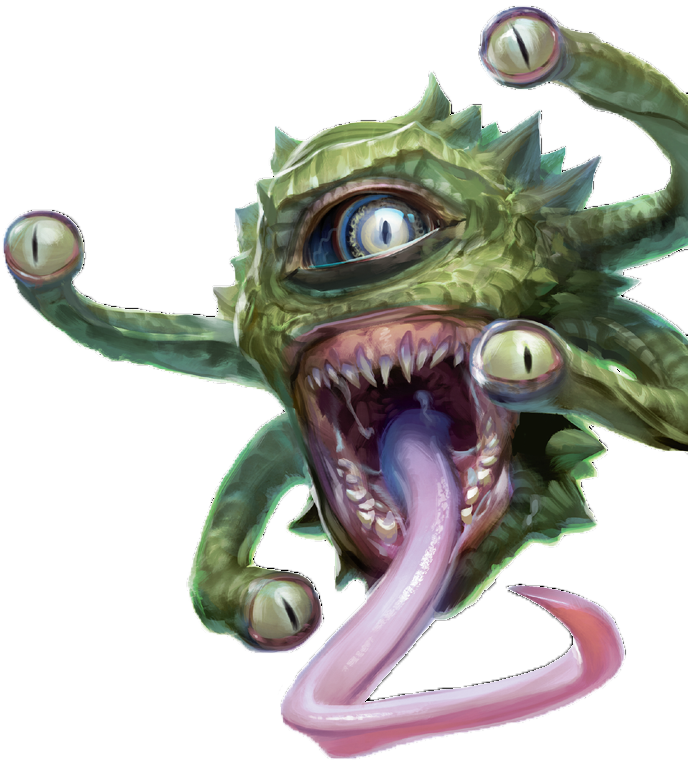 You are essentially paying to weasel your way into Whitemoon Dreams’s gaming menagerie and marvel at all of their cool toys, they’ll even let you keep some too. We see full retail games often charge upwards of $75 or $90 (or more) for deluxe/collectors editions, which is kind of what this is – only you’re doing it up front, and you’re helping support the developers and the game itself. Also, Whitemoon is a small studio, they aren’t EA or Ubisoft. You’re not going to get a bottle opener, map, wristband, keychain, limited edition toilet paper, etc. like you would in “deluxe” editions of games you see at Gamestop. You will get awesome goodies in game, and you will be helping out a small developer put forth an awesome, true-to-form version of a game you love. Not to mention you’ll get a developer that is actually listening to, and cares about, your feedback (more on that in a minute). Anyway what I’m getting at is – don’t chip in 60 hard earned dollars if you only want the finished product – just wait for release. Now, all that all being said there is a new “Standard” early access edition that will only set you back $40. Is the $40 early access worth it? Same factors apply, however possibly much less than before. This one can now be answered with simpler questions: “Do you like Warmachine?” and “Are you going to get this game at launch anyway?” – if you answered yes to either or both of those, you should grab the standard edition now before it goes up in price at launch. Maybe you don’t care about the bells and whistles and extras, great, pick this version up! Another aspect of early access titles is: how active are the devs, do they listen and take feedback well? In Whitemoon’s case, the answer is absolutely. Not only did some of the devs watch my livestreams of the game, but they listened to my complaints, and tweeted me to let me know they were working on things like the UI, controls, and camera. These are people who are tuned into the folks playing their game, and that is an intensely good thing. Believe me, as a person who’s got hundreds of hours clocked into other early access titles, I certainly wish developers more often cared about fixing game breaking bugs than adding new hats and jackets into an absurdly broken game…but that’s a rant for another day. Getting back on track here, buying any game is a risk. I can’t even begin to count the number of $60 titles I’ve purchased that turned out to be incomplete bundles of hot air hellbent on selling me DLC just so I could experience the full game. Luckily, that’s not the case with Whitemoon Dreams and WMTactics. 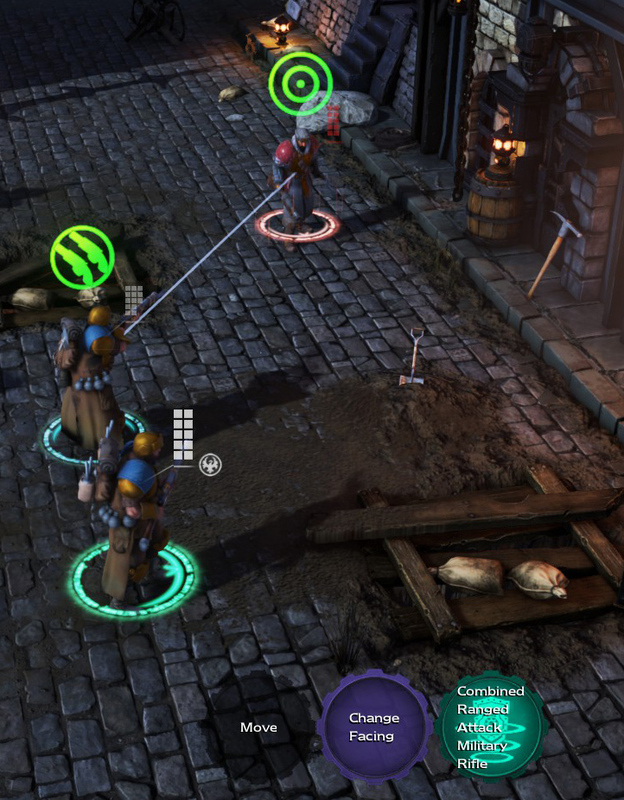 Multiplayer mode in WMTactics is ever expanding, they have added a few new maps since initial Early Access release and there are now a total of 3 to play in as we speak (ruins, a forest, and a snowy mountain area). You can host your own match, connect directly by IP, or join another person’s game via the server browser. There is a “quick match” option which is nice, but depending on the time of day you want to play there may not be anyone around to actually go up against. This is largely due to the fact that the game hasn’t launched yet. You can now see the Steam name of your opponent in-game and use the Steam client to chat with them, however there currently still is no in-game chat during your matches. This might seem like an oversight, but once again I believe they are focusing on other things right now. Either that or this is done on purpose, in order to deviate from the mad trash talking that goes on in most online games. If they never implement a true chat system I won’t be too broken up about it. As far as performance goes, I’ve not noticed any lag or performance issues or anomalies thus far. So, since not everyone who is interested in the game is not necessarily going to come from the tabletop crowd it’s important that there are some tutorial materials in place. Directly within the game main menu is a link to some tutorial videos that take you to YouTube. These are helpful, and I’m sure will be improved upon and made available within the actual game client around launch. A full blown in-game tutorial would be best here though, as a lot of people learn by doing. There’s also direct links via main menu buttons to your logs directory and reporting bugs, which should show once again the dedication of the team behind the game. I should also say that personally, if you hit them up on twitter they almost always reply. The steam community forum section is also alive and well, so be sure to check it out. I hate even having to mention the Early Access stuff, but almost everyone I’ve encountered while talking about the game has asked me if it was worth it, or if they should buy it, so I felt it was necessary to cover the topic. I’m passionate about games and so I hope you didn’t mind my pseudo-tirade. Anyway, let’s get back to focusing on the awesomeness of Warmachine Tactics and wrap this up, shall we? The game is in good hands, and it gets better every patch day. With dedication like this in an early access capacity, I’m going to go out on a limb and say that you’ll probably be able to continue relying on that same level of top notch dedication to the game throughout it’s life. Hey, if it does well hopefully we’ll see a Hordes game too! Projects like this rely on us as gamers to give it a fighting chance. Definitely consider giving the game a shot, at a $40 bar to entry it might not be for everyone, but I think that’s a good price for a solid and extremely replayable title. You can also pick it up on G2A for a lot cheaper than you’ll find it on steam. I’ll be streaming it more and more as time goes on (and of course, as I have more folks to play with) so please, hit me up on Player.me or Twitch if you’d like to play sometime. I hope to see you on the battlefield! This is a great review. I appreciate how in-depth you went with the various portions of gameplay. I also watched the video, and for anyone who hasn’t seen it, it’s a great look at the various portions of the single-player side of things.